I thought I would share an experiment I’ve just successfully completed, whereby I can now wirelessly control ML states, for example image capture, Dual ISO, Advanced Bracketing and Auto ETTR, ie without touching the camera. The dongle is permanently plugged into my 5D3 and requires no batteries. 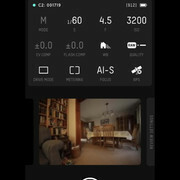 The dongle’s functionality allows it to control various, but not exhaustive, camera functions, via an app (I have mine running on my iPhone, iPad or iPod). Once you have selected a state, by choosing the WB value that corresponds to that state, you then use the app to simply toggle, using the metering mode app button, between the two metering option extremes, top to bottom. The Lua script then does the rest. Obviously, this is a simply demo or proof of principle of how to interact with ML without touching the camera. If I progress the idea I will tidy things up. Also, there are limitations: the biggest being you need a look up table (or remember) to convert WBs into ML states. For those interested, here is the (crude) script. Bottom line: a bit of fun for me, but an insight into using ML, especially for those use cases where you don't wish to touch the camera and/or can't touch it. It was a Kickstarter I bought into a long time ago that ran late by nearly two years. Anyway, they started delivering a few months ago and I have one running on my 5D3.